Ready to check out some stunning art over the weekend? 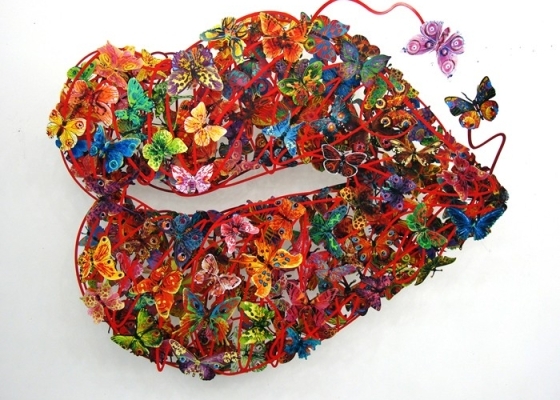 David Gerstein and life is presented to you in descriptions of hues…. While minimalism is the language spoken by many, David Gerstein walks away from that with his vibrant works that almost have a story hidden somewhere. This Israeli artist isn’t shy of using bright reds, yellows, greens and blues to craft his sculptures, paper cuts, prints and photographs. With the wake of his home county’s long-drawn-out political and social scenario, Gerstein’s works come as a charming surprise. And this isn’t just for the restrained Israelis. In fact, his effervescent works may not be very far from being therapeutic to the mind. They have a playful magnetism in big strokes and clever placements. Poetic Mirror, his first solo show in India, is on at the Visual Arts Gallery, New Delhi until May 15, 2014.